I have a pear tree, which is very zealous. Whatever it decides to do, it does in excess. First in the spring it sends out all sorts of new branches--all of them vertical. I snipped them off after they grew a few feet, but they merely resumed their skyward climb for 10 feet! Then the pear tree flowered and produced tremendous amounts of fruit. All the branches bent over more than a bow and arrow bends. Some of the branches literally snapped under the weight. What can I do to help this poor tree? If you are fertilizing this tree, I'd recommend that you stop, it doesn't seem to need any more! In your circumstance, you want to do a summer pruning rather than a winter (dormant season) pruning. The dormant season pruning will stimulate more vigorous growth, when your goal should be instead to open the tree up to let more light in. Just don't prune too late in the season -- since any pruning will stimulate growth, you don't want fresh green growth to be exposed to winter chill. It's best to do it in early/mid summer so that the new growth has a chance to harden off before winter. If you are trying to control the height, you can cut back the central leader to just above the top scaffold. The general pruning advice given in Mike Perry's answer is good, though I'd recommend removing any downward-facing branches. These don't help anything, and they're more likely to break when loaded with fruit. An addition to the tools he lists there, you might also consider a pole pruner. This is a long, telescoping handled (12-16' or so) pruner to reach tall branches. It has a pruning saw attached to the end. It also has loppers on the end with a rope that you pull to close the shears. Just don't stand under the branch that you're cutting! Remove limbs that cross (rub against each other) ie Remove one of the limbs, so that two limbs aren't rubbing against each other. Relieve the weight on some of those "downward" branches by shortening them. Remove (cut-out) some of those "downward" branches. Reduce the height so it's in scale with the overall shape of the tree (this will need to be done over the course of a few years). Thinning the fruit each year will greatly help reduce the overall stress on the branches ie Will prevent the branches from sagging too much under the weight of the fruit. Before wintertime arrives, cleanup the "orchard floor" ie Rake up all the leaves and pick up all the fruit from the ground underneath the tree(s), doing so will help prevent diseases from overwintering in the ground under the tree(s). It looks like you have a good size "tree ring" (cleared area) around the base of the tree(s), once you've finished clearing that area (and the surrounding area) prior to Winter, lay down a 2inch (50mm) thick layer of mulch. Personally I would use good quality compost, start approx 4 to 6 inches (100 to 150mm) away from the trunk of the tree(s) and work out to the edge of the "tree ring". Using compost as a mulch in this situation has the added benefit of feeding the tree(s) naturally and slowly. Then add a fresh 1inch (25mm) layer every year after you've cleared the "orchard floor". First, decide on the height and shape you wish to finally achieve, keep in mind this may take 3 or 4 years to achieve on mature, overgrown trees. Never prune off more than ⅓ in a pruning season (per year). Keep the tree balanced ie Don't prune one side "heavily" & the other "lightly". Only prune at the correct time of year (for your tree). Exception to above point: Remove damaged limbs immediately. Nowadays it is not considered necessary to treat the cuts with any kind of sealant. This is especially true if the cuts are made correctly, the tree should be able to heal itself naturally. Pruning shears, up to 1inch (25mm) diameter. Lopping (long handled) shears, up to 2inch (50mm) diameter. Variety of hand saws, from 1inch (25mm) up to 4inch (100mm) diameter. Chainsaws, from 2inch (50mm) up to felling giant Redwoods, Sequoias. Best left to the pro's when using this dangerous power-tool. What I did on a apple tree in this type of trouble was cut off the thinner branches, leaving the vigorous sturdy shoots. Then I topped them off at the third main lateral. This slows the tree down and increases the height. Also try to keep the branching thin and airy, and keep the branches that slant down trimmed off to improve the structure. Not the answer you're looking for? Browse other questions tagged fruit-trees trees pruning tree-care pear or ask your own question. What should I do with my Cherry trees? Why aren't my fruit/nut trees flowering? 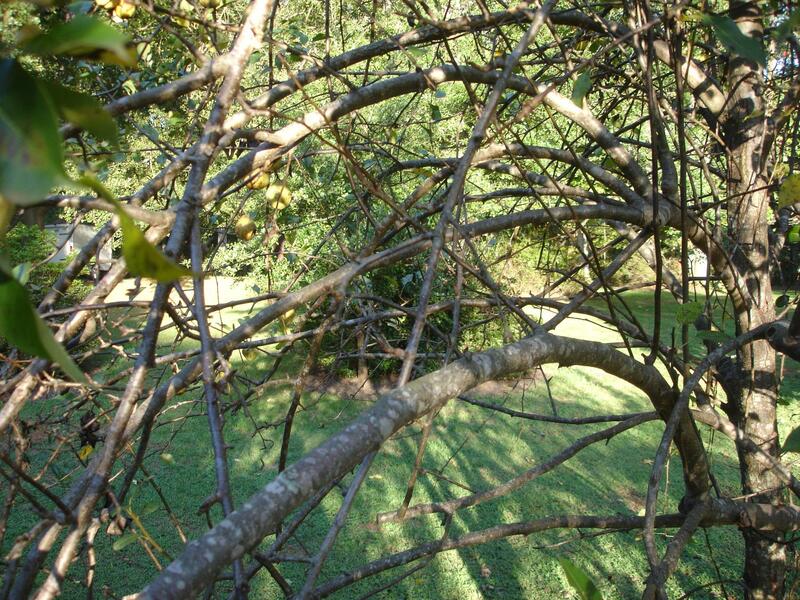 How should I prune an overgrown peach tree? What is the proper way to prune a Fig Tree? How and when to plant young grafted fruit tree? 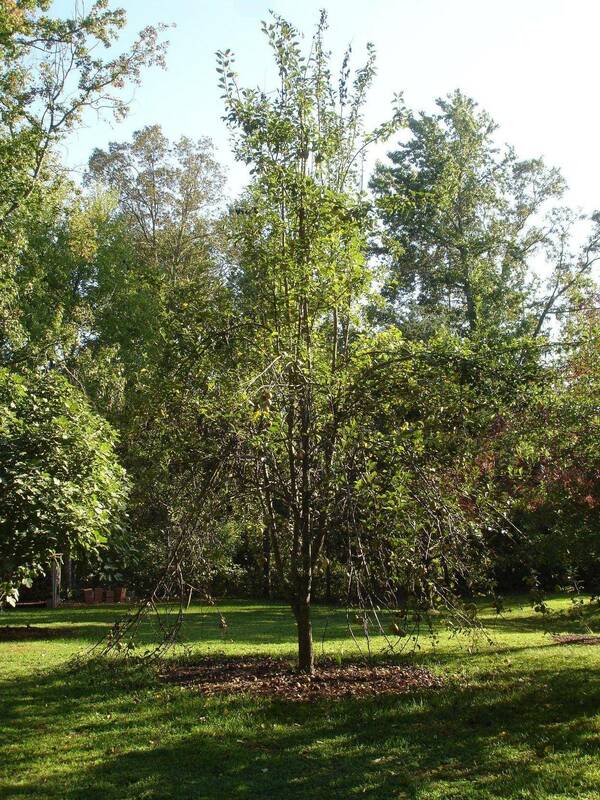 What time of year to mulch/feed trees? How high should I cut fescue grass? Does a pomegranate tree need propping up? When is it ok to prune an overgrown apple tree? Why are the cherries dropping off my cherry tree?